The aims of the course are to give students an all-round overview. We cover Bowen, the moves and how the therapy works on different levels from the skin to internal organs and also on a physiological level. Also a general background in horse anatomy and physiology, saddlery, conformation, horse management Inc lungeing. We aim to put across our experience with horses and how Bowen has enhanced many horses' lives. 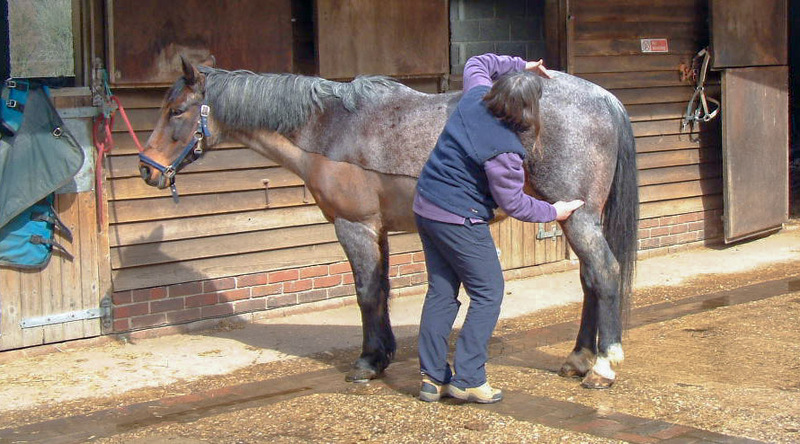 The Equine Bowen technique is a hands on holistic therapy which through a series of non-invasive moves over muscles and connective tissue allows the body to re-balance and so able to put problems right. The Equine Technique was pioneered in Australia as was the Human Bowen Technique by Tom Bowen. * Unexplained deterioration in performance. This course is designed for those who have basic horse care knowledge either experience in the industry or as a horse owner. We intend to provide a wide look at the industry and most disciplines including work shops with farriers, saddlers and experienced people from the horse world .All students will have to have completed the first 4 days of the human Bowen course to begin training. Entry requirements for training in Equine Bowen. * Students must have completed the first 4-day introductory level of the human Bowen technique tuition prior to commencing the equine Bowen course. * A sound knowledge of Horse Care i.e. Pony Club or BHS examinations or experience of having your own horses. * Students must have a complete understanding of the Bowen move, pressure position and the 2min breaks. * To be able to see the whole picture to include rider and the horse. * Cross reference will be made with the human course. * To equal the high standards that is mandatory in other complementary therapies. The course will be run from Eastwood Stud Farm (www.eastwoodstudfarm.co.uk), which is a busy livery yard so some safety rules will apply, sensible footwear will be worn when around the horses along with sensible clothes, hard hats will be worn when lunging the horses, there already various dogs on the yard so no more please. Tea and Coffee will be available during the course and there are local pubs for lunch of bring your own. A list of local B&B's is available from us. 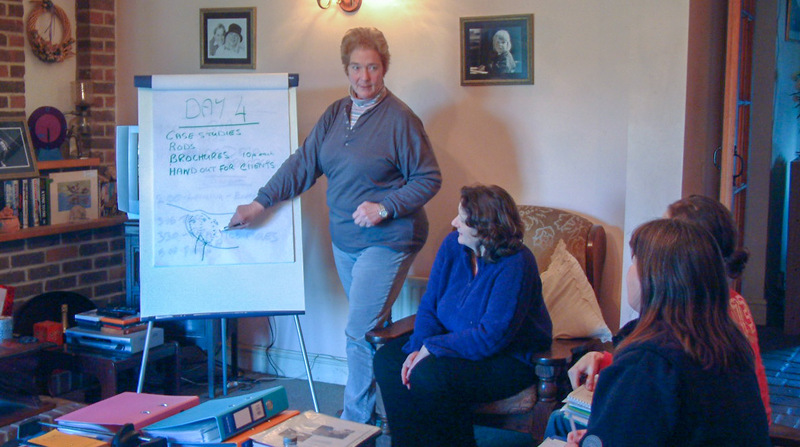 The course will be 14days, split into modules with reviews in-between which will include some workshops. Each module will cover Bowen moves and some A plus should time permit lectures on other related subjects. These 4 days are an introduction to the Equine Bowen with comparisons to the human moves, how the horse may react and possible outcomes to the treatment. Over the 4days there will be plenty of hands on work so students become comfortable with the moves. There will be a limited no. of students enabling us to give some one to one supervision and plenty of time to discuss moves and how they apply. 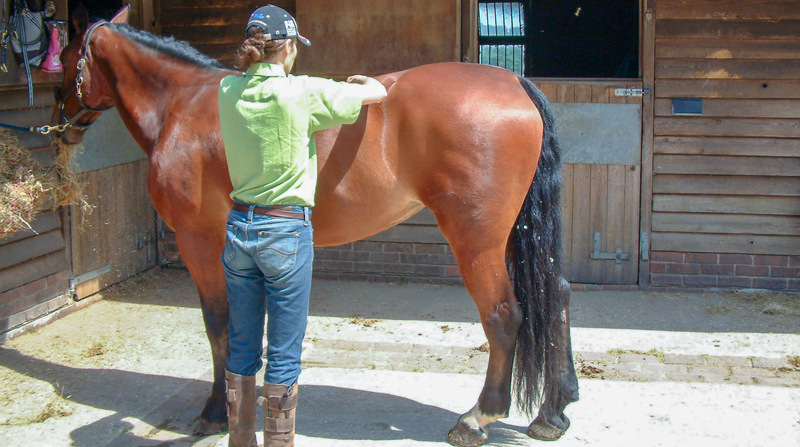 Students will be required to complete 10 case studies between the 1st and 2nd level with 3 treatments per horse. This will include repeating the moves already learned and ironing out any problems that people may be having, also some workshops on relevant subjects. To include more moves a more in-depth look at the systems affected by Bowen and some time will be spent on how to help the owner to help the horse with some basic exercises which I have found very useful. Review of case studies. A further 10 case studies need to be with me min 2 weeks prior to the Final level. To again go over what has been done to help with any problems with the moves or case studies also to include more workshops and lectures. These days will be a review of the whole course going over all moves and touching on subjects in workshops .There will be a final assessment of each student with a short written paper also a short exam on a. And a practical exam with a full treatment. We will be providing workshops that are to cover various subjects of horse management. We will be providing workshops throughout the year to further your Bowen development and to talk thro cases etc, two of these per year are mandatory.